Whether you’ve been sewing all your life, or are just getting started, it can be hard to find a great sewing machine. 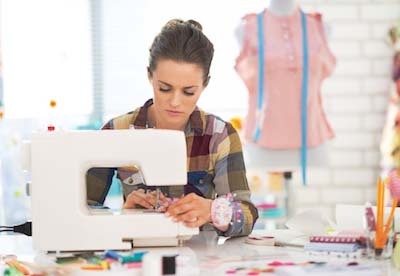 After all, if you’re busy sewing, you probably don’t have time to keep up with the latest brands, models, or innovations. With so many different options on the market, it’s a bit overwhelming to shop for your new one. That’s why we’ve started So Sew Reviews! Our site is designed to help you find your ideal match quickly and easily. We’ve put our time, energy, and expertise into finding the absolute best models on the market. Our goal is to help you figure out exactly what you’re looking for in your new equipment, and show you a range of options to suit just about any need! In our reviews, we compare dozens of top models, from all the major sewing brands. We choose only the most reliable, efficient, and user-friendly models to recommend to you, so you can stop shopping and get back to your needlework! On this page, you’ll find a quick run-down of our top three all-purpose recommendations. We’ll also show you previews of our more specific guides, so you can easily find the best workstation for beginners, quilting, children and more! The Brother CS6000i is one of the most popular models on the market right now. We love the value for money on this one! This one’s our top recommendation to the average buyer. It’s loaded with a computer system that compares to some options that are more expensive, and it comes with lots of accessories that are perfect for quilting.There are 60 stitches built in, and 7 different styles of one-step button hole. We think that’s more than enough for the average home needleworker to be getting on with. It has plenty of storage space for your accessories, and it comes covered by a 25-year warranty and excellent customer service for life! We think the CS6000i is the perfect balance between the price of a budget model and the versatility of pricier models. If you’re the sort of person who uses their workstation regularly but not for anything too specialized or intense, this should be ideal! This Singer gives you the ultimate versatility with a full computer system and lots of built-in features. It’s actually the most popular sewing machine on the market, as far as we can tell. Different retailers have different rankings, but this is a machine you’ll see bought and sold absolutely everywhere. It’s one of our favorite options for beginners who want to get creating right away without spending so much time learning technique with a manual. Likewise, the sheer amount of features means it’ll help more experienced sewers tackle their most ambitious tasks quickly. There are lots of smart automatic tricks up its sleeve, like the way it automatically secures the beginning and end of each stitch, so you don’t have to remember to tie them off. It threads automatically, adjusts tension automatically, and has an impressive 100 stitches built-in. Plus, there’s push button controls for setting the needle end position, the stitch type, and even turning on an autopilot setting. With lots of feet, accessories, and tools thrown in, this Singer offers a great package that will appeal to both beginner and experienced sewers alike! This Brother model is our most budget-friendly recommendation. It’s the cheapest of our Top Three, and it’s the new updated version of the the #1 best-seller on Amazon, the Brother XL2600i. We think it’s a more than worthy upgrade over the old XL model, so it’s now our recommendation for budget buyers and beginners! It makes a great starter option, or a tool for experienced sewers who just need something for the occasional job. Even though it’s budget-priced, it has all the important features and more! It gives you even more features than the older model, and with even better build quality. There are 27 stitches built in, 6 basic accessory feet, and all the essential tools you need to cover most tasks. We like this one more than the budget competition because it has plenty of little conveniences, like the drop-in bobbin loader, automatic winding, and 1-step button hole feature. That last one’s very impressive, especially on one that costs so cheap. Best of all, it’s covered by a 25-year warranty-just as long as the top-shelf models! To start, set a budget for yourself. That’ll narrow down your options significantly, and give you a better sense of what features you can expect for your money. Think about how much money you have to be spending in the first place, and consider how much you’ll be using your new workstation. That’ll help you figure out how much it makes sense to invest. If you’re a casual sewer, or just looking for something to fix up clothes now and again, you probably don’t need an expensive workstation. You could get away with spending $300 or less, perhaps even only $100 or so. There are actually many fantastic machines in that price range. Don’t feel like you’ll be missing out on anything huge by staying frugal! Conversely, if you’re going to be making lots of projects on a regular basis, or sewing for your work, you should consider investing more money in it. $300+ machines are where you’ll want to direct your attention. These will be heavier-duty, more versatile workhorses that suit pros. Make a list of all the key features you want. Of course, the features you’ll need depend a lot on the type of sewing you do. So, think about your various projects, and what would help you get them done more efficiently. If automatic features make your life easier, make sure to look for them. Things like automatic threaders, bobbin winders, and buttonholers can be very handy if you do lots of projects. Most of us like at least some help with the tedious bits! If you’re old-school, and don’t like lots of fancy gadgets getting in your way, look for one with manual knobs and adjustments. Thankfully, there are still plenty of models keeping it simple these days. Remember, more expensive doesn’t always mean more features! You can find awesome products for cheaper price ranges, with all the features you’ll use and more. Some even offer functionality that may be missing in expensive models! Make sure you choose features you’ll actually use. Many models have some added extras which you’re not likely to take full advantage of. It’s worth spending your money on the features that count, rather than on lots of extra gimmicks. If you save money by not purchasing one that has features you won’t use, you will have more money to buy project supplies later! When you’re thinking about features, try to consider what specific things will improve your efficiency, and make yours easier for your personal technique. Automatic features and technology help make up for specific weaknesses in your technique or skills. For example, if have shaky hands or poor eyesight, an automatic needle threader can save you lots of time and frustration. Do you have a “lead foot?” Many computerized versions have speed controls, and can even be operated without the use of a pedal. Above all, you’ll need to decide between a computerized model and an all-manual setup. This is a matter of personal preference. Choose a computerized model if you think it’ll help you work faster and more efficiently, but don’t feel obliged to get one! Plenty of excellent manual models are still being produced, and they’re easier to use for many needleworkers who are experienced and have strong technique. Another big factor in making your decision is your own skill level. You’ll want to think about where you’re at right now, so you can make sure you’ll be able to use your new workstation. It’s also good to think about your goals, so you can choose one that’ll grow with and expand your abilities. Try and find a balance between something that’s accessible to use right off the bat, and something that gives you room to grow. Automatic features can help shorten the learning curve for new craftspeople. On the other hand, manual features help novices practice and learn proper technique. This is all a matter of preference, so brainstorm all the key aspects of your ideal model before you shop. Start out with a list of what you currently sew, or would like to sew. Jot down any fabrics you use and which you layer together. Do you use thick material, or layer several pieces of fabric? If so, you may need a sturdier model. Otherwise, a lighter, less industrial option will probably be suitable. If you’re looking to make more elaborate or decorative creations, you’ll probably want something with a wide range of stitches built in, as well as some adjustment settings. If you’re only going to be doing basic, utilitarian tasks, you can probably get away with a more no-frills machine. If you’re interested in embroidery, you’ll want to make sure your sewing machine has the appropriate settings and equipment to get the job done. It’s a zen experience. Just like knitting or weaving, sewing with a machine is a time to let your brain escape from all the hectic distractions of your life, and focus on something concrete and tangible. It strengthens your mental problem-solving faculties. Of course, as zen as needlework can be, something always, always comes up, doesn’t it? And when you hit a snag, or have to resolve a funky edge, your problem-solving instincts are strengthened, making you a better craftsperson. There are some zen lessons here too, since you’re also learning how to cope and adapt to change and unexpected twists in your life. It saves you lots of money. By being handy with your mechanized needles, you can easily repair garments and other fabric items that would otherwise have to be thrown out. Instead of buying replacements, you can simply patch, stitch, and reinforce your way to lifelong pieces. It’s an opportunity to help people in your life. Whether you’re repairing your nephew’s jeans or making a quilt for a charity auction, sewing is a nice, hands-on way to help out others. You have a tactile gift that you can share with the world and make everyone’s life a little brighter. It’s a great creative outlet. With every project, you can add your own personal flair. Choose distinctive patches for a treasured jacket, or design your own new coat from scratch! One of our favorite models for novices, the Singer 7258 Stylist offers beginning sewing enthusiasts a fantastically easy experience. That’s why it’s also featured in our all-around favorites above! It has an onboard computer with 100 stitches, 7 different one-step buttonhole settings, and countless convenient features to help you jump the learning curve. The simple push button controls, jam-proof bobbin, speed control slider, needle down setting, and the thickness-sensing, automatic thread tension selector make sewing a breeze! If you’re looking to jump right into creating, the Singer is for you! The Janome 2212 is a great basic machine at a relatively low price. This simplified option might be the priciest model we recommend in the affordable category, but it’s still far less expensive than most models on the market. The Janome is the best-made budget sewing machine we’ve encountered to date! Since it’s all mechanical, there are very few components to go wrong. Cheap computer boards and automatic tensioners go wrong all the time, so it sometimes pays to keep things old-school! You’ll have to do things manually on the 2212, but you can rely on the components to back you up! It has all the essential functions you need, and it’s versatile enough to get any basic projects and tasks done well. It has 12 built-in stitches, manual stitch adjustments, and a free arm for stitching sleeves and cuffs. We particularly love the manual tensioning knob. It’s far better than having a crummy automatic tensioning system like you’d find on comparable Brother’s or Singer’s. You also get a basic set of feet and tools to get you through all your everyday tasks. More than any of its specific features, though, the 2212 stands out from the budget-priced competition with its solid build quality and superb reliability record! You may pay a bit more for it up front, but you’ll never have to replace it. This Brother is one of our all-time favorites. It’s a full-size, professional grade machine with all the features you could possibly want for quilting. The onboard computer is simple and versatile, with push button controls for easy navigation. It’s loaded with nearly 300 stitches, with patterns for any project. There are even letters for monogramming and adding text to your fabrics! We also love the programmable feature, which lets you create your own designs! In addition to being smart, it’s also powerful. This one’s built around a metal frame for added durability, and it cranks out up to 850 stitches per minute-perfect for big projects like quilts! You get a full accessory set, with 11 different feet, and a big hard case for carrying it all around. If you’re a serious quilter, give this one a look! While you can find plenty of kid-specific sewing machines online, a lot of the options are basically toys. We think if you’re going to learn sewing, you really ought to learn on the real deal! This Janome 2206 is a simple, user-friendly machine that’ll get your kids sewing in no time! It’s sturdy enough to survive those early mistakes, and it has plenty of potential to grow with your child’s abilities. It’s a simple manual design, with all the basic adjustments and 6 basic stitches to get a novice started. The free arm and drop feed features will be ready when your child gets some expertise under their belt. You’ll also get the basic accessory set, with 3 feet and a few essential tools. It includes everything your child needs to get started. And with a 25-year warranty, this is one they can own for a very long time. Remember to always supervise your child. You may also want to purchase a finger guard to protect young hands. Our favorite embroidery tool, the Brother offers the value of owning a utility and embroidery machine all in one! There are 67 built-in stitches, and ten one-step buttonholes to get through all your sewing tasks. The large work area makes this one a good choice for quilters, and the touch screen makes navigation simple and easy. It also includes a four-by-four-inch embroidery frame to use in combination with the 70 pre-programmed embroidery designs. You can also use the USB cable to download patterns from the web! It comes with plenty of feet and embroidery tools, and it’s all covered by a 25-year warranty. This is a good choice for any sewer who is interested in dabbling in embroidery, but not wanting to give up utility sewing, or quilting functions. It’s also available with an optional side cutter foot, which makes the Brother SE400 work like a Serger as well! If you’re looking for one machine to do absolutely everything, you’re looking at it! This one is Amazon’s all-time best seller, and it’s easy to see why. It’s simple, affordable, and versatile enough for all sorts of tasks. You can do either 3 or 4-thread overlays, and choose from one of 22 different stitch functions that are pre-programmed. We especially like the differential fabric feed system, which helps you work evenly on fabrics with uneven textures or decorative ruffles. It’s also easy to learn, thanks to the numbered spool system and color-coded threads. At up to 1300 stitches per minute, it works quickly, and has a free arm to help you finish off cuffs and sleeves. It comes with all the essential accessories, and uses standard sewing needles. Like the other Brother machines, it’s covered by a 25-year warranty and lifetime phone support. Brother is a Japanese technology company that makes a whole range of products, from fax machines to printers to sewing machines. They’ve continued to offer products that innovate the ways we live and work. From computerized sewing machines to precision printing technology, Brother has innovated how we create and share information, ideas, and even our own creations. Brother has very impressive top-notch customer service, and offers 25 year limited warranties on all their new sewing products. On top of that, they also offer free phone assistance for the life of your Brother machine! Unlike other companies, they’re easy to reach, and won’t leave you on hold for absurd wait periods. We love Brother sewing equipment for the smart features, as well as the extremely competitive price points. They’re one of our favorite brands for fancier stitchwork, thanks to the excellent computer systems. You can find our reviews of all our favorite Brother models by clicking through to our guide! The Janome name has stood for excellence in sewing for over 90 years now. As the first manufacturer to build an independent sewing research facility, Janome developed a wide range of features which have set their machines apart and changed the marketplace as a whole. Janome actually got their name from their major innovation in home sewing– the round bobbin. Their machines are extremely functional, and offer some of the best reliability on the market. If you’re looking for a manual, old-school machine with modern conveniences, you’ll want to look at a Janome. We especially love their automatic tension-adjustment system. But don’t let that make you think they’re behind the times! They’ve got new computer systems to compete with any other brand, including their latest flagship model, which is wireless-enabled and can embroider from your iPad! Click through to our special Janome brand guide to learn more about the company and see our favorite products! Want to compare the rest of the top sewing machines on the market? Check out the best sellers on Amazon!